We take a look at how to use NGINX to set up request rates for different locations on HTTP requests and configure additional features to rate limiting. One of the most useful, but often misunderstood and misconfigured, features of NGINX is rate limiting. It allows you to limit the amount of HTTP requests a user can make in a given period of time. A request can be as simple as a GET request for the homepage of a website or a POST request on a login form. Rate limiting can be used for security purposes, for example, to slow down brute force password guessing attacks. It can help protect against DDoS attacks by limiting the incoming request rate to a value typical for real users, and (with logging) identify the targeted URLs. More generally, it is used to protect upstream application servers from being overwhelmed by too many user requests at the same time. In this blog, we will cover the basics of rate limiting with NGINX as well more advanced configurations. Rate limiting works the same way in NGINX Plus. To learn more about rate limiting with NGINX, register for our live‑webinar. 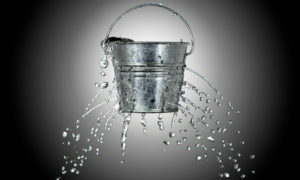 NGINX rate limiting uses the leaky bucket algorithm, which is widely used in telecommunications and packet‑switched computer networks to deal with burstiness when bandwidth is limited. The analogy is with a bucket where water is poured in at the top and leaks from the bottom; if the rate at which water is poured in exceeds the rate at which it leaks, the bucket overflows. In terms of request processing, the water represents requests from clients, and the bucket represents a queue where requests wait to be processed according to a first‑in‑first‑out (FIFO) scheduling algorithm. The leaking water represents requests exiting the buffer for processing by the server, and the overflow represents requests that are discarded and never serviced. The limit_req_zone directive defines the parameters for rate limiting while enabling rate limiting within the context where it appears (in the example, for all requests to /login/). Key - Defines the request characteristic against which the limit is applied. In the example, it is the NGINX variable $binary_remote_addr, which holds a binary representation of a client's IP address. This means we are limiting each unique IP address to the request rate defined by the third parameter (we're using this variable because it takes up less space than the string representation of a client IP address, $remote_addr). Zone - Defines the shared memory zone used to store the state of each IP address and how often it has accessed a request‑limited URL. Keeping the information in shared memory means it can be shared among the NGINX worker processes. The definition has two parts: the zone name identified by the zone= keyword, and the size following the colon. State information for about 16,000 IP addresses takes 1 megabyte, so our zone can store about 160,000 addresses. If storage is exhausted when NGINX needs to add a new entry, it removes the oldest entry. If the space freed is still not enough to accommodate the new record, NGINX returns status code 503(TemporarilyUnavailable). Additionally, to prevent memory from being exhausted, every time NGINX creates a new entry it removes up to two entries that have not been used in the previous 60 seconds. Rate - Sets the maximum request rate. In the example, the rate cannot exceed 10 requests per second. NGINX actually tracks requests at millisecond granularity, so this limit corresponds to 1 request every 100 milliseconds. Because we are not allowing for bursts, this means that a request is rejected if it arrives less than 100 milliseconds after the previous permitted one. The limit_req_zone directive sets the parameters for rate limiting and the shared memory zone, but it does not actually limit the request rate. For that, you need to apply the limit to a specific location or server block by including a limit_req directive there. In the example, we are rate limiting requests to /login/. So now each unique IP address is limited to 10 requests per second for /login/ - or more precisely, cannot make a request for that URL within 100 milliseconds of its previous one. The burst parameter defines how many requests a client can make in excess of the rate specified by the zone (with our sample mylimit zone, the rate limit is 10 requests per second, or 1 every 100 milliseconds). A request that arrives sooner than 100 milliseconds after the previous one is put in a queue, and here we are setting the queue size to 20. That means if 21 requests arrive from a given IP address simultaneously, NGINX forwards the first one to the upstream server group immediately and puts the remaining 20 in the queue. It then forwards a queued request every 100 milliseconds and returns 503 to the client only if an incoming request makes the number of queued requests go over 20. With the nodelay parameter, NGINX still allocates slots in the queue according to the burst parameter and imposes the configured rate limit, but not by spacing out the forwarding of queued requests. Instead, when a request arrives "too soon," NGINX forwards it immediately as long as there is a slot available for it in the queue. It marks that slot as "taken" and does not free it for use by another request until the appropriate time has passed (in our example, after 100 milliseconds). Suppose, as before, that the 20‑slot queue is empty and 21 requests arrive simultaneously from a given IP address. NGINX forwards all 21 requests immediately and marks the 20 slots in the queue as taken, then frees 1 slot every 100 milliseconds (if there were 25 requests instead, NGINX would immediately forward 21 of them, mark 20 slots as taken and reject 4 requests with status 503). Now suppose that 101 milliseconds after the first set of requests was forwarded another 20 requests arrive simultaneously. Only 1 slot in the queue has been freed, so NGINX forwards 1 request and rejects the other 19 with status 503. If instead 501 milliseconds have passed before the 20 new requests arrive, 5 slots are free so NGINX forwards 5 requests immediately and rejects 15. The effect is equivalent to a rate limit of 10 requests per second. The nodelay option is useful if you want to impose a rate limit without constraining the allowed spacing between requests. Note: For most deployments, we recommend including the burst and nodelay parameters to the limit_req directive. By combining basic rate limiting with other NGINX features, you can implement more nuanced traffic limiting. This example shows how to impose a rate limit on requests from anyone who is not on a "whitelist." If $limit is 0, $limit_key is set to the empty string. If $limit is 1, $limit_key is set to the client's IP address in binary format. Putting the two together, $limit_key is set to an empty string for whitelisted IP addresses, and to the client's IP address otherwise. When the first parameter to the limit_req_zone directory (the key) is an empty string, the limit is not applied, so whitelisted IP addresses (in the 10.0.0.0/8 and 192.168.0.0/24 subnets) are not limited. All other IP addresses are limited to 5 requests per second. You can include multiple limit_req directives in a single location. All limits that match a given request are applied, meaning the most restrictive one is used. For example, if more than one directive imposes a delay, the longest delay is used. Similarly, requests are rejected if that is the effect of any directive, even if other directives allow them through. IP addresses on the whitelist do not match the first rate limit ( req_zone) but do match the second ( req_zone_wl) and so are limited to 15 requests per second. IP addresses not on the whitelist match both rate limits so the more restrictive one applies: 5 requests per second. 2015/06/13 04:20:00 [error] 120315#0: *32086 limiting requests, excess: 1.000 by zone "mylimit", client: 192.168.1.2, server: nginx.com, request: "GET / HTTP/1.0", host: "nginx.com"
limitingrequests - Indicator that the log entry records a rate limit. excess - Number of requests per millisecond over the configured rate that this request represents. zone - Zone that defines the imposed rate limit. client - IP address of the client making the request. server - IP address or hostname of the server. request - Actual HTTP request made by the client. host - Value of the Host HTTP header. We have covered many features of rate limiting that NGINX and NGINX Plus offer, including setting up request rates for different locations on HTTP requests and configuring additional features to rate limiting such as the burst and nodelay parameters. We have also covered advanced configuration for applying different limits for whitelisted and blacklisted client IP addresses and explained how to log rejected and delayed requests. Published at DZone with permission of Amir Rawdat , DZone MVB. See the original article here.